How to Protect Cedar Shingles How to Protect Cedar Shingles At one time, cedar was one of the few types of Cedar Shakes Products available to builders. The availability of cedar, ease of making shakes by hand , and the durability of cedar in wet coastal areas meant that it could be produced on-site at a very low cost. At one time, cedar was one of the few types of Cedar Shakes Products available to builders. The availability of cedar, ease of making shakes by hand, and the durability of cedar in wet coastal areas meant that it could be produced on-site at a very low cost. As more homes were built, cedar shingles were manufactured using saws and became a common fixture on new houses. Today, there are many types of shingle materials available that are cheap to mass produce and cedar shingles, or a “real wood” roof is now considered a premium product and commands top prices for materials and installation. Their beauty and natural appearance blend well with the surrounding environment and enhance the architecture of the building. 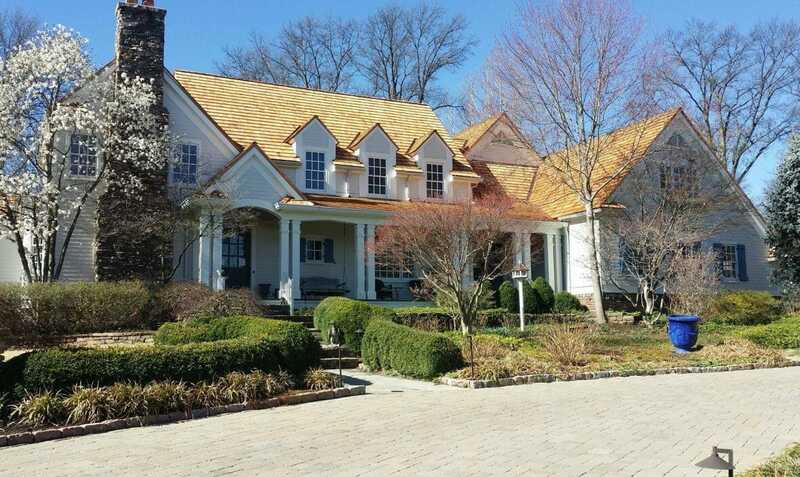 Cedar has a long service life and with regular maintenance and care it's possible for a cedar shingle roof to have a lower cost compared to asphalt over its service lifetime. Cedar is absorbent and will swell and contract with wet/dry cycles of weather. Each cycle creates microscopic cracks and fissures that invite organic materials to become embedded and foster the growth of moss, lichen, and other plants. The most basic maintenance the homeowner can do is to regularly remove leaves, pine needles, and other debris that accumulates on the textured surfaces of the roof. In the Lower Mainland, it may be necessary to do this several times each year. If debris isn't removed, it can slow the shedding of water and allow moss to grow on the surface, both of which compound the risk of leaks. Regular sweeping and hosing off loose material is recommended but it's also okay to use a pressure washer if the operator uses extreme care and does not to erode the wood. Optimal lifespan can be achieved if the roof is allowed to dry quickly between wet cycles. Examine the area around the roof perimeter and above. Airflow can be improved by trimming back branches, thinning, or even removing trees that restrict light and wind from reaching the roof. And finally, never allow branches to touch the roof. The mechanical motion of limbs can leave sweeping grooves in the surface and loosen shingles. A cedar roof can be cleaned with a variety of commercial preparations that will remove stains, moss, lichen, and molds. You may want to consider an all-in-one treatment that cleans, inhibits future growth of these harmful plants, and protects the wood from UV. All of which will extend the life of the roof and keep it looking attractive for many years.